Dan Bekavac won the @msptpoker @paysbigpoker Main Event for $126,998 and his second MSPT title. Aaron Frei tops 778-entry field to win the $360 MSPT Regional @gates_poker in Colorado for $46,680. 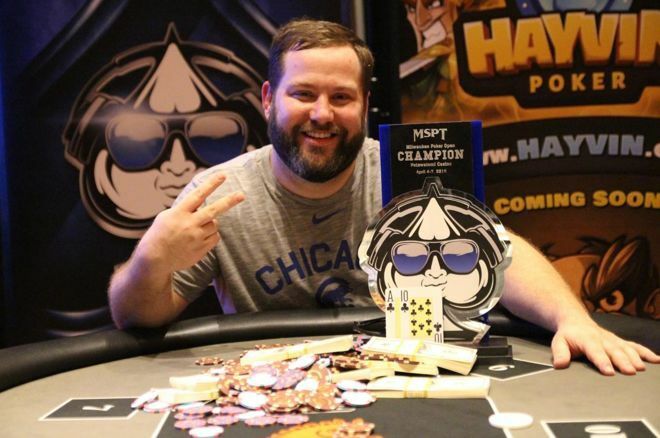 With 11 kids, Dan Bekavac has a lot of mouths to feed, and the 36-year-old won’t have any trouble doing it after topping a 625-entry field to win the Mid-States Poker Tour (MSPT) Milwaukee Poker Open over the weekend. The $1,100 buy-in tournament was held at Potawatomi Hotel & Casino and awarded Bekavac, a wholesale distributor for Amazon, a $126,998 first-place prize. It marked his second MSPT title after he won the MSPT Season 4 Ho-Chunk Wisconsin Dells. "I feel good, finally got it off my back," Bekavac told MSPT officials after the win. "It's been six years, finally got another title. We got eleven kids, all under the age of thirteen, all living in one house, a big house. I told them if we win we're going to Fiji, so I gotta pay for a round trip for four to Fiji." Prior to the win Bekavac had $151,743 in career earnings with a previous best of $76,668 for winning the aforementioned MSPT Ho-Chunk tournament back in 2013. In 2012, he also won a Venetian Deep Stack Extravaganza IV $400 NLH event for $19,627. Others to finish in the money in the top 63 were Paul “Big Daddy” Elfelt (11th - $9,071), Joe Matheson (16th - $6,048), 2015 MSPT Wisconsin State Poker Champion Ben Wiora (25th - $3,749), Keith Heine (32nd - $2,903), MSPT Majestic Star champ Mike Shin (46th - $2,419), and reigning MSPT and HPT Player of the Year Aaron Johnson (57th - $2,298). According to updates from the event, Bekavac notched six of nine final table knockouts. One was MSPT Venetian Poker Bowl III champ Brian Wilson, who got it in good with ace-nine against Bekavac’s queen-six. However, a lady appeared on the flop and Wilson had to settle for fourth place and $42,333 in prize money. It also gave him the early lead in the MSPT Season 10 Hayvin Poker Player of the Year race. After Spencer Alexander busted Ken Daciolas in third place – the result of the latter’s pocket kings getting cracked by nine-eight suited after the former flopped two pair – it set up a heads-up match with Bekavac holding a more than 2-1 chip lead. In the final hand of the tournament, Alexander got his stack in holding queen-jack suited and was looking to improve against Bekavac’s ace-ten suited. That didn’t happen though as Bekavac flopped trip tens to send Alexander out the door in second place for $78,013. Also taking place the same weekend as the MSPT Potawatomi Main Event was a $360 Regional Event at Golden Gates Casino in Black Hawk, Colorado. That tournament attracted 778 entries and saw well-known Colorado player Aaron Frei claim the title for $46,680. 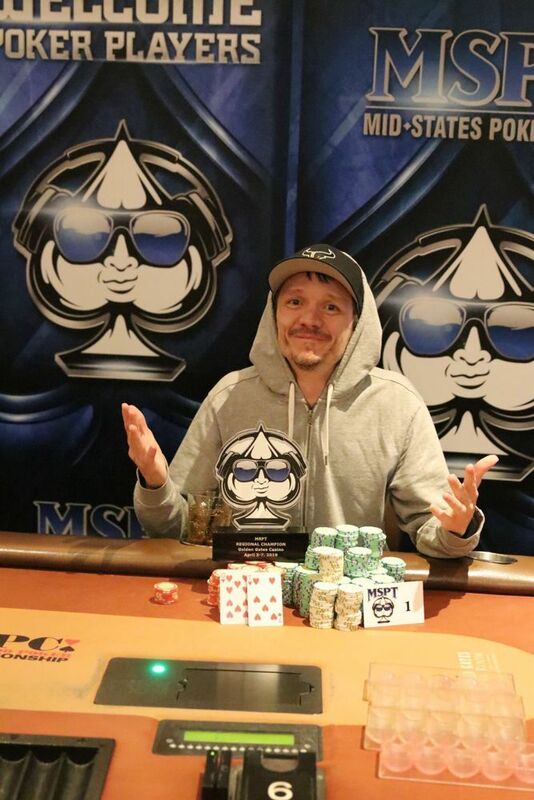 It was the fourth time he cashed a Regional Event at Golden Gates, and complements his four cashes from $1,100 MSPT Main Events, including a 10th-place finish in the Season 8 MSPT Golden Gates for $6,824. Others to cash the Regional Event were Richard Trenholme (13th - $2,801), Bobby Sanoubane (16th - $2,334), Cody Hanson (31st - $1,027), “Money” Mike Monetti (32nd - $1,027), Sammy Aweida (42nd - $864), Ryan Dodson (51st - $794), and Scotter Clark (69th - $700). Season 10 of the MSPT continues this weekend with a $1,110 buy-in, $300K GTD Main Event at Golden Gates Casino. From there it’s on to Canterbury Park in Shakopee, Minnesota from April 26-28 for a $1,100, $300K GTD Main Event. Images courtesy of the MSPT.